PARIS (AP) — On a spectacular day for track and field fans, Kevin Mayer of France set a decathlon world record in front of a home crowd, just hours after Eliud Kipchoge smashed the marathon world record in Berlin. Competing at the Decastar event in Talence, southwestern France, world champion Mayer finished with a total of 9,126 points, improving on the previous record of 9,045 set by American athlete Ashton Eaton at the 2015 world championships in Beijing. 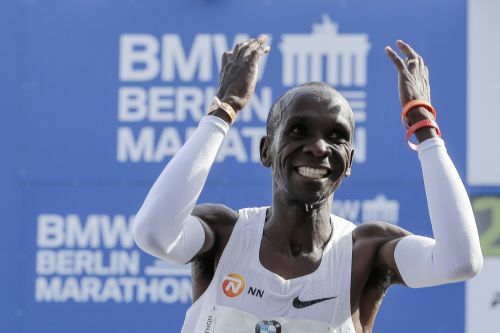 Earlier, Kipchoge clocked 2 hours, 1 minute, 39 seconds at the Berlin Marathon. In the decathlon, Mayer fell on his back in celebration after he crossed the line in the 1,500 meters — the last of 10 events — in 4 minutes, 36.11 seconds, a time he knew would guarantee him the record. "I've been waiting for this moment for a long time," said Mayer, who became the first Frenchman to hold the decathlon world record. "We live for moments like this that are simply incredible. I couldn't cry. I don't have any more tears left because I was crying so much before the 1,500 meters." Mayer came to Talence on the back of a disappointing showing at last month's European Championship, where he was eliminated after three fouls in the long jump. He made a strong start, setting a personal best in the 100 and long jump, but Mayer was 140 points behind Eaton's record after the first day. He was even more consistent on Sunday with 13.75 seconds in the 110 hurdles and a 50.54-meter throw in the discus. Mayer cleared 5.45 meters in the pole vault and reached 71.90 meters in the javelin. The Decastar has been a major fixture of the season-end for years. Back in 1992, just after he missed out on the Barcelona Olympics, Dan O'Brien of the United States set a world record of 8,891 in Talence. "That was an incredible display of ability!" he wrote. "Important thing to me has always been to keep pushing the limit and inspiring others to do the same. The more 9K can become commonplace the better." In Berlin, Kipchoge successfully defended his 2017 title, pulling ahead of other runners early on amid perfect conditions. Mild temperatures and little to no wind in the German capital gave runners in the 45th edition an advantage over last year, when rain slowed the race. Frank Jordans and Pat Graham contributed to this report.